Make a statement in your great room with a two-story, cathedral or vaulted ceiling. Modern homeowners are looking to build smaller and more thoughtful homes. By eliminating redundant rooms, like a breakfast nook and a formal dining room, you can reduce square footage while still maintaining the function that you need in your house. One way to make a smaller home plan feel larger is a two-story great room. Simple house plans with a vaulted ceiling in the great room will appear larger and airier. Elevated ceiling also allow space for large windows that will bring natural light into your living spaces. Two-story homeplans with a cathedral or vaulted ceiling may have a balcony or loft on the second floor that overlooks the great room and adds dimension. There are many ways to decorate your cathedral or vaulted ceiling to add character to your great room. Decorative beams can be a simple addition to give your home rustic charm or you can create a more elaborate design. Your fireplace can become a statement piece with stone work extending from the base to the top of the cathedral or vaulted ceiling. 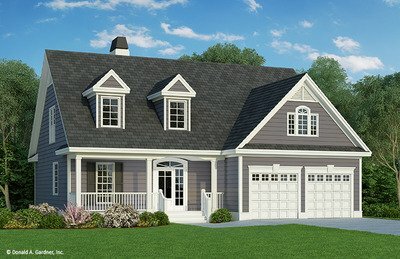 Donald Gardner Architects has a wide range of house plans with two-story great rooms. Find small to luxury designs and in square footages ranging from modest to luxury. The Braxton home plan 1343 features a two-story great room with a gorgeous curved staircase. A balcony overlooks the great room and the foyer. Another example is the Eastlake 1256. This Farmhouse enjoys an open great room with a fireplace and access to the rear porch. A second floor balcony offers views to the great room and foyer below.